Bulgaria’s President Roumen Radev has been in office as head of state since January 22. Of the 74 days since then, he has had to deal for all of five with an elected government. For the rest, the stewardship of the country nominally has been held by a caretaker cabinet that he decreed. Elected on a socialist-backed ticket in a victory that caused previous Prime Minister Boiko Borissov, leader of the centre-right party GERB, to resign, former air force commander Radev has the constitutional role of representing the unity of the nation. Bulgaria is not a very unified nation. In the midst of its perenially stormy politics, Radev is flying into turbulence. Significantly, his choice of course seems not without deliberation. No navigational choice ever is a matter of just winging it. But the phrase “pilot error” does not exist by accident. Borissov led his GERB party to winning the largest share of votes in March 2017’s early parliamentary elections. If he succeeds in negotiations with a nationalist coalition, the United Patriots, he will return to head Bulgaria’s government for a third time. Radev would be Borissov’s third President. The first, Georgi Purvanov, was a former Bulgarian Socialist Party leader whose critics like to refer to him by his State Security code name, Gotse. The second, Rossen Plevneliev, was a former private sector figure recruited into politics by Borissov and who as head of state had the task of keeping, amid the unpredictably choppy waters of his years in office, as steady a hand on the tiller as was possible. Now there is Radev, who until the summer of 2016, was a hardly known figure. Not unknown. When he was commander of the air force, Radev resigned, saying that he lacked the resources to carry out his commission. Borissov, then prime minister, talked him out of it. Resignation and the withdrawal of the resignation happened all in the course of a single day, as the Greek dramas of very ancient yore used to. 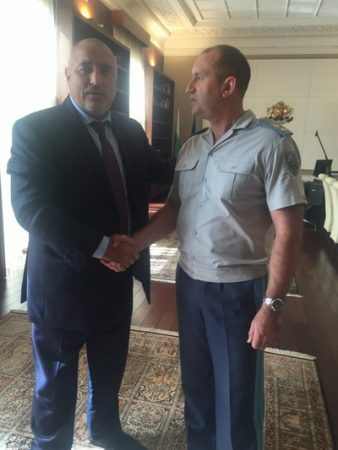 Borissov and Radev were photographed, for the purposes of a government photo opportunity, clasping hands. Boiko Borissov and Roumen Radev, October 2015. Now, between the second Borissov government and the presumed coming third, there is an interregnum. As the appointer of the current caretaker cabinet, Radev is a powerful figure. That power, and its consequences, have been apparent in recent weeks. The principal task of the caretaker cabinet was to deliver viable elections. Under interim Prime Minister Ognyan Gerdzhikov, it dwelt on all manner of topics, such as Bulgarian aspirations to join the euro zone, to join the Schengen visa zone. The caretaker cabinet, and most of its individual ministers, have been energetically dismissing various senior officials. Skeptics, or at least seasoned observers of Bulgarian politics, may muse that it is a matter of time before Borissov returns to the Cabinet office in Sofia, and brings them back, where the law allows him to do so. Borissov has complained about these dismissals, these political purges, as he appears to view them. But what has been of considerable concern, and moreover, controversy, has been the conduct of the caretaker cabinet and the ministers involved in it, and the officials under its authority. The March 2017 early parliamentary elections were seized with controversy about the “Turkish vote” – the real or attempted exercise of the franchise by Bulgarian passport-holders in the southern neighbouring country. Those Bulgarian passport-holders are in Turkey because of a communist-era project to force Bulgarians of Turkish ethnicity to adopt Slavonic identities. Gross abuses of human rights attended this process. Consequently, in a deal between those in power in Sofia and in Ankara at the time, there was a mass “great excursion” of Bulgarian Turks to Turkey at the end of the 1980s. Latter-day Bulgaria lives with the consequences. These are the existence of political parties that have pursued this electorate and that mainly have been led and founded by people with backgrounds in the very same State Security that was part and parcel of the communist regime. In turn, the existence of these “Turkish parties” or “pro-Turkish parties” is a thorn in the flesh for Bulgarian nationalists, and at the same time, a convenient bête noire for them to use to rally their electorates. The final loosening of the grip of the bitter winter of early 2017 and its pained transition to a new spring saw these ultra-nationalists at the Turkish border, seeking to bar the bussing-in of the “Turkish vote”. It was an issue that came to predominate, drowning out even the issue that had been telegraphed in the 2016 presidential elections (not least by Radev), the rejection of open facilities for the shelter of refugees and migrants. While the Turkish-ethnic-Bulgarian vote is hardly a new theme in Bulgarian politics, having been a fixture in Bulgarian electoral politics for years, it came to predominate. In a strange if brief saga, the caretaker cabinet’s Justice Ministry made public a draft law that would have barred Bulgarians from voting unless they had been resident in the country prior to a parliamentary or presidential election. After the controversy hit the fan about this bill, within 24 hours of news breaking about it, it was withdrawn, and the official who – it was said, on his own bat – had put it online, was fired. He did not go quietly into that bad night. He alleged that the bill had been discussed at a meeting at which Radev was present. Well, he would, wouldn’t he? The politics of the 1960s pushed its Mandy Rice-Davies to the unwonted fore, and the politics of the 21st century will do the same. And what target presents itself better than a head of state of whom it already has been suggested that he has somewhat exceeded his mandate? A Friday night in Sofia, at the end of March. A time that most would be heading off in hope of a pleasant weekend with all the promises that a spring may hold. But yet, in the Cabinet offices, Gerdzhikov’s interim administration was gathered, in the offices above Dondoukov Boulevard where the commuter traffic was clustered on the way home. Their 5pm meeting had but one agenda item. It took them two hours to deal with it. The item was to repeal an ordinance decreed by the Borissov government, in September 2016, on the provision of funding assistance to municipalities to enable them to participate in the integration of refugees. Bulgarian-language training, accommodation, job-finding, that sort of thing. The scheme was in line with European Union agreements, of contested status, on dealing with the continent’s largest-scale challenge before the bloc existed, to do a better job with displaced persons that it had in the chaotic days that followed the end of the Second World War. A time when, lest anyone not know this, the term “displaced persons” was invented – for Europeans, their lives torn asunder by the devastation of war. On the campaign trail in the quest for the votes of his audiences, Radev had criticised this ordinance. So had the Bulgarian Socialist Party, in the prelude to the March parliamentary elections. With the March elections over, and a return of Borissov to power a likely probability, the special meeting of the Gerdzhikov cabinet was called. Reports made it apparent that Radev wanted the caretaker administration to revoke the ordinance. There were misgivings about all of this at the meeting, it seems from a transcript. But the deed was done. A few days after the repeal, Radev again stuck to his wickets about the scrapping of the ordinance, pushing the line that the ordinance was not all it could be, emphasising that the ideal would be a decree that also protected the security of the nation and of Europe. He said all of that in the presence of visiting European Council President Donald Tusk. By the night of April 5, there were reports in some Bulgarian media alleging that the President’s office had been complicit in the drafting of the texts on the – unconstitutional and by-then withdrawn – proposed amendments on curtailing the rights of Bulgarian citizens abroad to vote. Emilia Drumeva, of the President’s office, was reported to be the author of the controversial bill. Supposedly, she had expressed regret about what had happened to the “young man” – the official made to walk the plank for allegedly having posted online the amendments without co-ordinating them with the caretaker Justice Minister. The “young man” – Lyubomir Talev – whom sunset found on April 5 to be unemployed and who had been a senior legal council official at the Justice Ministry, before the headlines – alleged that on April 3 he had been at a meeting at the Presidency, at which Radev was present. That was the genesis of the now-withdrawn amendments, and their domicile requirements for voting, according to Talev. The Justice Ministry, in announcing the withdrawal of the bill, alleged that Talev’s actions in putting it on the ministry website “without co-ordination with the minister” had been “intentionally defamatory”. The minister, the statement said, had removed the draft from public discussion because of “imperfections in the text” and “inconsistencies with the constitution”. It is a fairly important document, the Bulgarian constitution. It does not empower the President to initiate legislation, or by implication have a role in doing so, if Talev’s allegations are correct and if that is really what happened. It may be that in a few weeks, probably some time after Bulgaria’s Eastern Orthodox Christian majority celebrates Easter, that Borissov returns to office – for the third time – as Prime Minister. He will have a difficult time of it, not least because of the trap he faces; restoring the ordinance on integration of refugees will expose him to political attack on “weakness on national security”, while failure to do so will expose Borissov to possible penalties from Brussels, which in no sense he can afford. Radev, who as noted took office on January 22 and who does not face a new National Assembly with a majority to impeach him, and with no one but hostile chatterati to even debate whether he is honouring his commission properly, and who thus politically is not going to be leaving the scene in any way, will face a Prime Minister and a political situation with which he is hardly likely to be entirely comfortable. Radev, the skilled flier but newcomer to the realities of politics, would be well-advised to strap in for turbulence. And perhaps, not a little flak in the skies of the years ahead. Borissov, unlike Radev, is not an aviator. His career started out in firefighting. He too may need safety gear. And all of this, lest we forget just precisely where we are poised in history, is at a time when the contest is so often not between rival policies, but rival forms of populism.